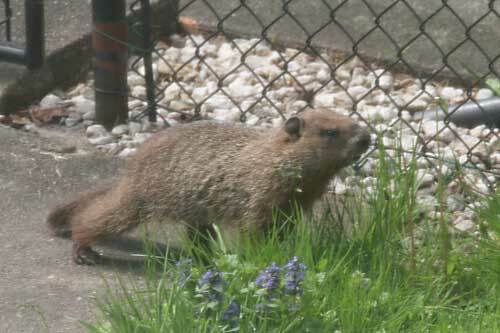 As I was busily building my raised beds for my garden I got a surprise inspection from a local groundhog. There are farms fields short distance and a small woods nearby and I guess he just decided to make his rounds. My photos were taken through a screen so they are a bit fuzzy. Having mostly lived in Toronto I don't have a huge experience with groundhogs. I remember my Mom had one living under the garage and would go and feed it every day. He would come out and visit with her. Groundhogs are solitary unlike the prairie dogs which live in colonies. Here is an article from a WOODCHUCK article from the University of Michigan. My father's garden used to be devastated by the woodchuck so he was not as appreciative of them as my mom. The only thing he seemed to be able to reliably grow was rhubard, potatoes and tomatoes, all poisonous plants. I'm surprised no groundhoud has moved in my hill on the right. 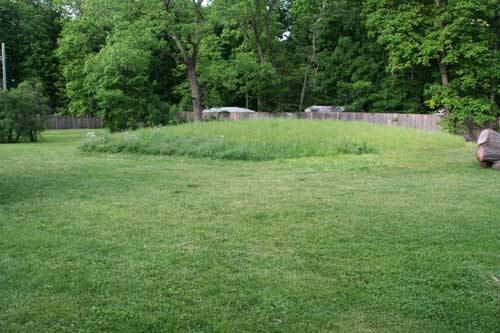 Dry ground is at a premium in a pooly drained area and my sceptic mound would be perfect. Groundhogs have been eaten with relish and here is a groundhog recipe from Mother Earth News. Farmers have found them to be a nuisance because they eat crops and also because they dig and make deep holes and cause a hazard to livestock. My little guy is in no danger whatsoever and will be welcomed if he decides to move in. He was very timid and ran away as soon as I went out. 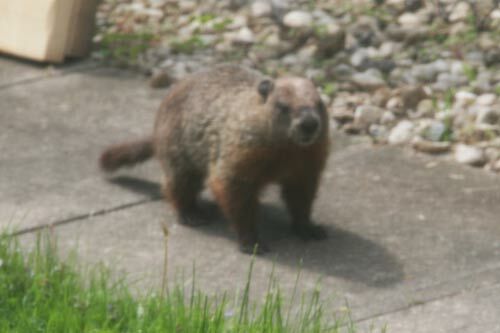 Photo was taken early spring and the groundhog is not very fat or shiny. Apparently they get very fat towards the end of the summer before they hibernate. Groundhog feeds early in the morning and early evening and sleep during the day. You often see them by the side of the road sunning themselves near the entrance of their den. If you disturb them they might whisle. They have a short life span, maybe 3-4 years in the wild and 10-14 in captivity. When this guy saw me, he took off and ran like the wind. Here he is checking to see if I'm following. Many animals consider groundhogs a tasty morsel. Wolves and Coyotes, Foxes and Dogs all hunt them. Lynx and Bobcats as well as hawks will welcome a fat groundhog breakfast. 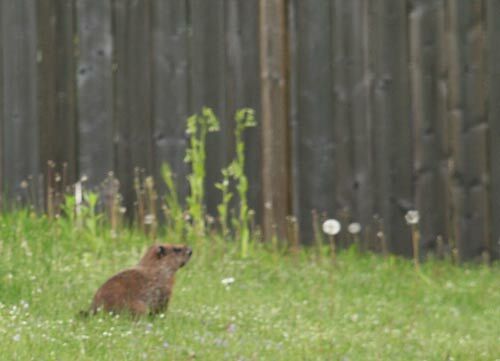 Groundhogs will fight and can inflict a good bite with their rodent like teeth. They are in the same family as squirrels and prairie dogs. Because they can store up lots of fat and hibernate during the winter, they can survive as far north as Labrador and the Yukon.